Once a year, the International Energy Agency (IEA) releases its World Energy Outlook (WEO), and it’s our tradition to review it. 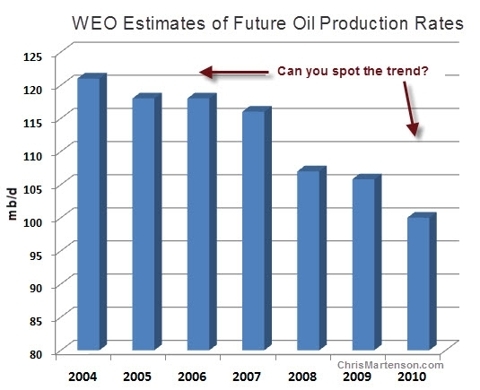 A lot of articles have already been written on the WEO 2010 report, and I don’t wish to tread an already well-worn path, but the subject is just too important to relegate to a single week of attention. Okay, it’s not quite as simple as that; there are a few complexities involved that require us to dig a bit deeper and to be sure our terms and definitions are clear so that we are talking about the same things. But if we can simply distinguish between two types of “oil” (you’ll see why that term is in quotes in a second), the story becomes much easier to follow. “Conventional oil” is the cheap and easy stuff. A well is drilled, pipe is inserted and oil comes up out of the ground that can be shipped directly to a refinery. Whether the oil is “sour” or “sweet” doesn’t matter; it’s still conventional oil. “Unconventional oil” refers to things like tar sands, ultra-deep-water oil, coal-to-liquids, oil shale, and natural gas liquids. In other words, oil that is much more difficult and expensive to produce. I might quibble that the all-time peak remains 2005 in the US Energy Information Agency data set, but the main point here is that the IEA has not only used the words “Peak Oil” (finally!) 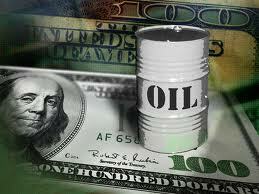 but they’ve done so in the past tense, at least with regard to conventional oil. First, pay close attention to the legend for the chart. Starting at the bottom, note that crude oil from “currently producing fields” (dark blue) is already in sharp decline and is expected to decline from a high of 70 mbd in 2006 to ~15 mbd in 2035; a loss of 55 mbd over 25 years, or 2.2 mbd per year. The next band up (gray) is crude oil from “fields yet to be developed,” which we largely know about but have not yet really started producing significantly. My only comment here is that these fields cannot overcome the expected rate of loss in the dark blue band below them. All of the conventional oil that we know about is now past peak. 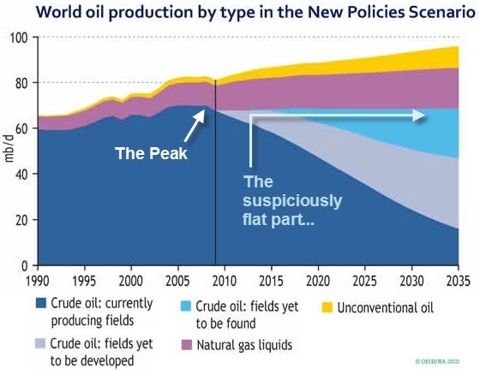 In order to keep conventional oil flat, we have to move up to the third band (light blue), which goes by the spine tingling name “fields yet to be found” – which will apparently be delivering a very hefty 22 mbd by 2035. In other words, the IEA is projecting that in 25 years, more oil will be flowing from “fields yet to be found” than from all the fields ever found and put into production by the year 2010. 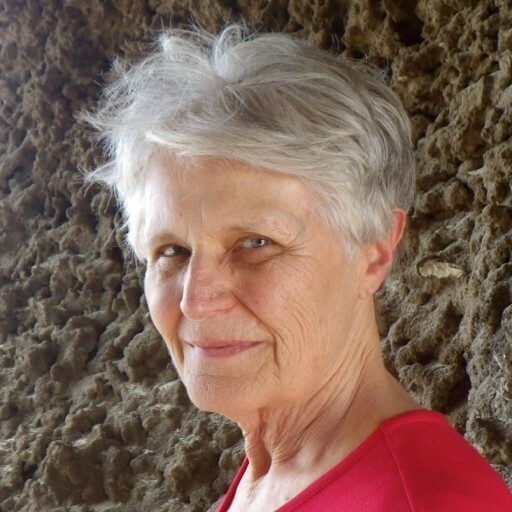 Colin Campbell, one of the earliest analysts of peak oil who has decades of oil field experience, is on record as saying that the “fields yet to be developed” category, originally introduced to the world as unidentified Unconventional in 1998, is a “coded message for shortage” and was, off the record, confirmed as such by the IEA. That coded message is getting easier and clearer to receive by the day. But back to the main story line. Even if the final assessment of future oil production isn’t notched down even one more tick, we have all the information we need to spot an enormous problem in the global story of growth. Assuming that we stick with the 99 mbd by 2035 estimate going forward, this represents a growth rate in oil of only around one-half of one percent (0.5%) per year between now and then. Under no scenario envisioned will future growth in fossil fuel supplies be equal to prior rates of growth. I cannot state this strongly enough: The WEO 2010 report is an official admission that Peak Oil is not only real, but it’s already here. Part II of this report (which is free to read) delves more deeply into the economic implications of the WEO 2010 findings and what investors should know. Those interested should click here to go directly to Part II.